This 50 acre vineyard in Saratoga makes some terrific wines. Its first vintages were crafted by Merry Edwards, who went on to Matanzas Creek before disappearing as a consulting winemaker for several producers. Chardonnay and Pinot Noir established the fame of this vineyard, but in recent years the Cabernet Sauvignon wines have become rather distinguished, too. 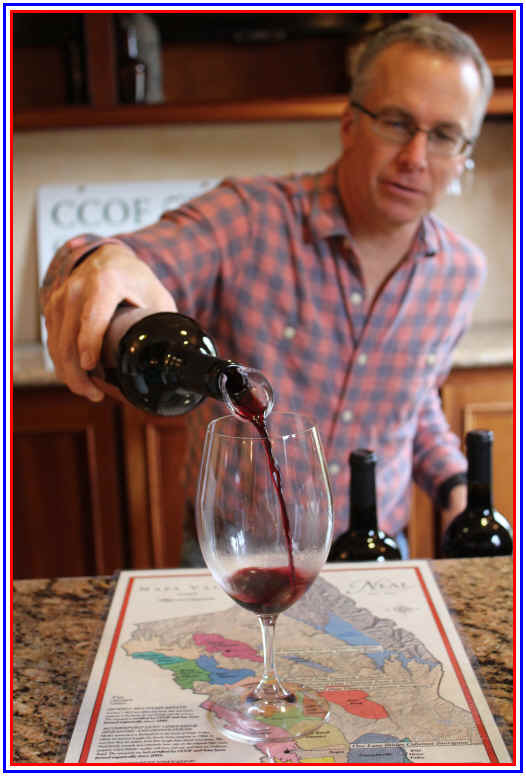 The Santa Cruz Mountains appellation is not often viewed as a prime source of Cabernet, yet most experts will put the Monte Bello Cabernet of Ridge as being of "grand cru" status. 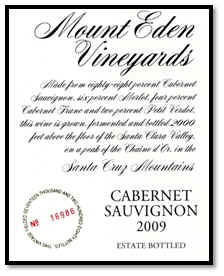 Mount Eden's Cabernet is also worthy of discussion, since it is, these days, routinely a 'serious' bottle of wine. The winemaker is Jeffrey Patterson and he's doing some very fine work. The wines are decidedly different from Napa Valley Cabernets, a combination of terroir and clonal selection. The 2012 is a brilliant wine, showing clear red fruit notes and a whiff of wood...it's not the pushing-the-envelope, mocha/espresso, slightly sweet affair which get a lot of praise from critics. This is a classic Cabernet and drinkable now. There's 10% each of Merlot and Cabernet Franc with 2% Petit Verdot. If you're having trouble with the math, that leaves 78% Cabernet Sauvignon. You'll find some red fruit notes, a hint of herbs and cassis along with a lightly cedary note. The wine is matured in French oak barrels and despite their use of a high percentage of new cooperage (60%), the wood is rather restrained. We suspect it will age quite handsomely for 8-15 more years. The name Narsai David is family to most Bay Area foodies. Narsai owned a noteworthy East Bay restaurant a lifetime ago and has been a vineyard owner in Napa for many years. There have been Narsai David wines over the years...we recall tasting some made by our old pal Travis Fretter many years ago. With his wife Venus, Narsai owns a Merlot vineyard in Oakville and some Cabernet vines in the Conn Valley. We tasted a rather nice, old-fashioned (that means it does not have 16% alcohol, a ton of sweet oak and the requisite "gobs of fruit" that are mandatory for a 95 point score from various wine critics) Napa Cabernet from the 2001 vintage. This wine is blended with both Merlot and Cabernet Franc. Bob Gorman, who's older than dirt and the author of Gorman on California Premium Wine (printed in 1975! ), found this to be a delight, reminding him of the wines of his youth. We like the dusty notes on the nose of this wine. It's a medium-bodied Cabernet and decidedly different from the wines-on-steroids so prevalent in the market. The fruit is bright and the wood is in the background. This is a lovely, elegant wine today and will be a lovely and elegant old wine if you hang on to it for a decade or so. Neal's estate vineyards on Howell Mountain in Napa. Please inquire about the rare 2001s...we still have some bottles in the shop. The story of this family goes back 40-something years to 1968 when Jack Neal started his vineyard farming business. The firm handles all phases of vineyard management and takes care of hundreds of acres around the Napa Valley. 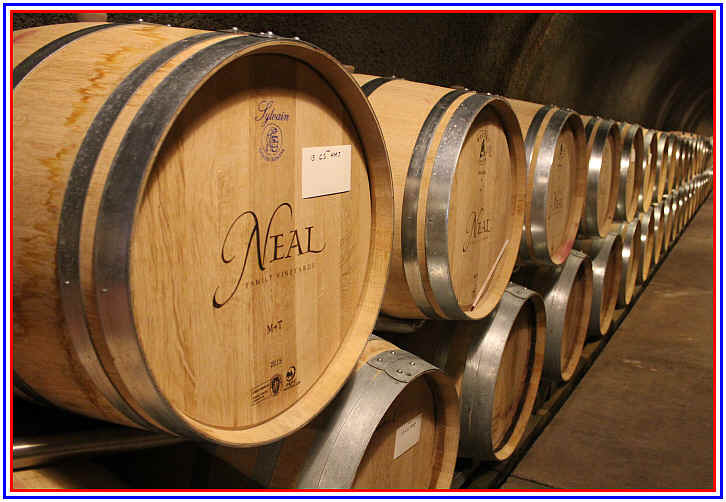 Neal's son Mark took over the company some years ago and launched a winemaking project in the late 1990s. The winery is up on Howell Mountain in the town of Angwin. Caves have been dug into the hill to mature future vintages. The Neal's first vintage is 1998 and it showed that, with good vineyard management, one can make good wine in a difficult vintage. Neal, by the way, farms organically. Their first wines were exceptional and they even skipped the 2000 vintage, Mark Neal saying he was not happy with the quality. The 2001 flew out of here, the wine having gotten quite a bit of "buzz" on the internet as computer-savvy wine geeks with a lot of time on their hands sent up a lot of virtual smoke signals singing the praises of Neal's 2001. It's a working winery...sure, it's a bit of a showplace, but first and foremost, they make wine! The winemaker is Kelly Wheat. We suppose this means, then, that Neal's wines are not gluten-free! The 2013 Napa is their current offering. It's a blend of Cabernet vineyards. Howell Mountain, Rutherford and Saint Helena are the sources for this wine. I was pleased to see this vintage is bright and deep, without being hugely-oaked, though they DO use lots of new barrels. The tannins are firm, but balanced, so if you want to pair a bottle of this tonight with a steak, go right ahead. The price remains rather reasonable, especially considering what I've tasted recently in the $75-$300+ price range. And of course, some of the "cult" brands fetch $500-$1500 upon release. 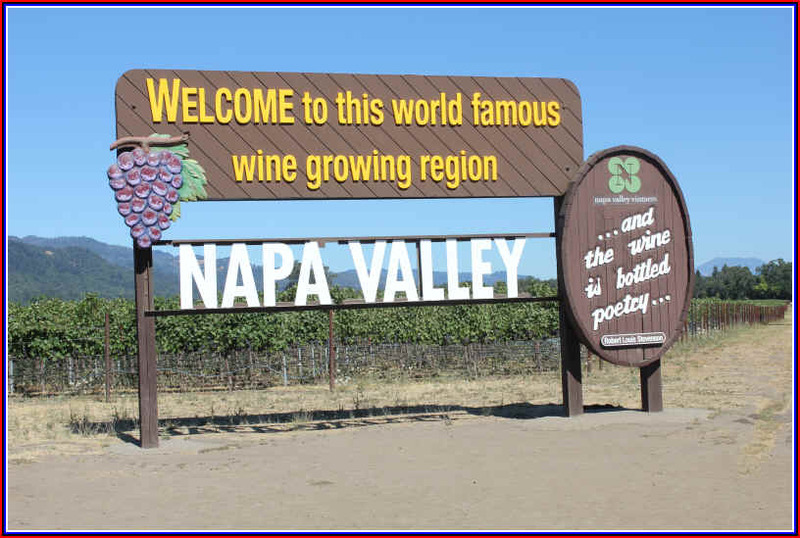 Mark Neal is keenly aware of the silly prices being asked by various newcomers to Napa. No track record and some of these people ask triple-digit prices counting on demand for wines with limited availability (allegedly) or a 90+ point score from some journal or web site. We recently spoke about the current wave of "Monopoly Money" being thrown around Napa with the sales of increasingly precious vineyards, prospective vineyard land, wine brands and wineries. He, as are we, is concerned about the economy in Napa and whether or not these prices are sustainable. Most Napa vintners think you need to beg for the right to throw hundred dollar bills at them. I told Mark Neal he ought to consider a "reserve" label: KNEEL. The Niner estate is a relatively new enterprise, being owned by the Niner family and not related to the San Francisco Forty-Niners, for example. Richard Niner is the head of the family and made his money over several decades of investment company work. Somewhere along the line he found himself in San Luis Obispo and he felt this was a good place to invest some of the monies made in the world of finance. In 2001 he finally took the plunge and bought his first vineyard. He's since added to the original vineyard holdings. Today Bootjack Ranch comprises 147 acres, while the Heart Hill covers about 45.5 acres and Jespersen Ranch covers nearly 78 acres. 2001 was their first vintage. We've tasted their wines over the years and they've routinely been well-made and of 'good' quality. In 2014 we were pleasantly surprised to find such a good bottle of Cabernet in a flight of "Double Gold" wines at the San Francisco International Wine Judging. In fact, Niner's 2010 Cabernet was tabbed as the "Best Red Wine," period. We've usually not been fans of many of the wine from Paso Robles. Many are made of over-ripe fruit. Some are simply commercial plonk. Some are perfectly okay for the tourists visiting the wineries, but the quality and price don't match very well with what is already in our shop. In the line-up of wines at the wine judging, you'd be hard-pressed to identify this wine as coming from a warmer-than-normal wine region. It's beautifully balanced and has dark fruit notes and a bare whiff of oak, though they claim one-third of the barrels were new. French and Hungarian oak, too. We often have customers asking for wines from Paso Robles, so this wine fits in nicely. The 2016 is 84% Cabernet with 9% Carmenere, 4% Petite Verdot and 3% Cabernet Franc. No Merlot this vintage. It's mildly earthy and shows some ripe plum fruit and a light touch of wood. This is dry and the tannin level seems fairly low, so drinking now or in the short term is ideal. Two brothers of Hungarian ancestry and a buddy of theirs have a little wine company called the Tricycle Wine Company. The Molnar brothers emigrated (or escaped) from Hungary to the US in 1956. They ended up planted some vineyards in California, so their sons had experience in the summer of doing some vineyard work. One of the brothers is a finance guy. The other, Peter, runs a Hungarian barrel-making company and he takes care of the vineyards owned by Tricycle. 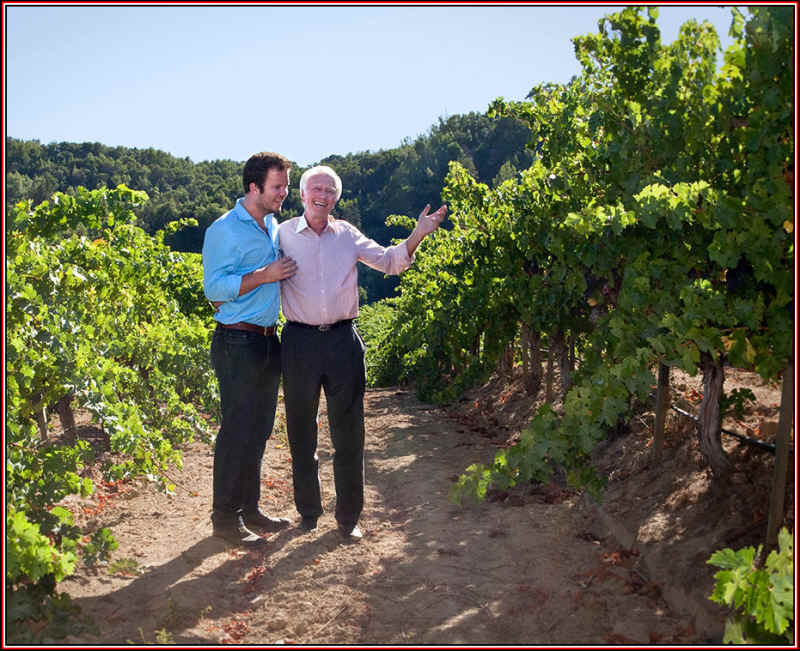 Peter Molnar and his father were snooping around Lake County, looking at a vineyard owned by the Beckstoffer family. A real estate guy showed them an old walnut orchard with small trees and really rocky soils at a fairly high elevation. The price for land in the late 1990s was rather low, and seeing all the obsidian rock scattered throughout, they invested in this relatively uncharted territory. Today they have 90 acres in the "Red Hills Lake County" appellation. The vineyards are fairly high, too, from 2350 feet above sea level to 2640. And they're making some good Cabernet from this place. We've found some vintages have been quite successful and the wine is offered at an attractive price. In fact, their sales company here has conducted trade tastings of Napa Cabernets and allowed these guys to attend...often outshining wines which cost a hundred to several hundred dollars a bottle. The 2016 is showing handsomely. The wine is 95% Cabernet Sauvignon, 4% Petit Verdot and 1% Malbec. And Hungarian wood is used for maturing this wine, with half the barrels being brand new. We like the brown spice notes which we associate with the oak and the black cherry/berry fruit of the Cabernet. The wine is medium-full bodied and the tannin level is modest, so you can drink this now. It will probably last a few more years, but I don't expect it to change significantly. Winemaker Dave Phinney got introduced to wine while supposedly studying in Italy...Surely he found the charm of Chianti while hanging out in Tuscany. Returning home to learn about Political Science at the University of Arizona. Apparently he got a job working in a store which sold wine and this set him on a career path that landed him in the Napa Valley studying at the University of Robert Mondavi. From there he had jobs at Whitehall Lane and Opus One...and then he made a tiny amount of wine under his own label: His father's middle name, Orin, combined with Mom's maiden name, Swift. And soon Orin Swift became a remarkable success story, as Phinney bottled a robust and flavorful Zinfandel-based blend called "The Prisoner." It became hugely popular and soon Phinney was adding other wines to the portfolio. He actually sold The Prisoner brand to a Napa Valley wine baron who then sold the brand for a tidy profit to Constellation Brands. Phinney retained the Orin Swift label for a few more years before his lotto ticket "won" and he pocketed a massive sum from the E&J Gallo wine company. Both Phinney and Gallo are closed-mouthed as to the purchase price. 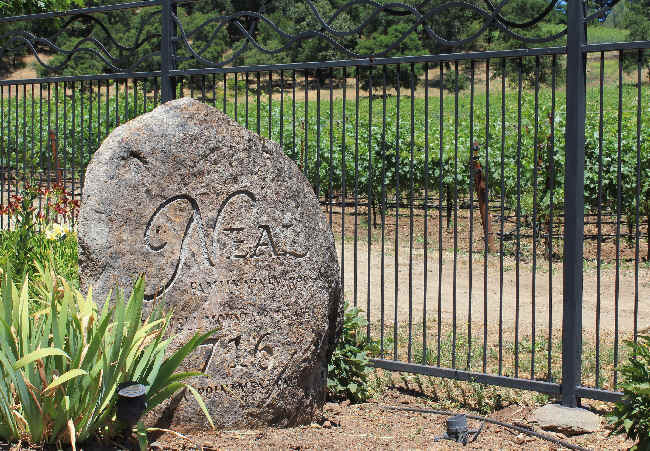 Some say he doesn't want his Napa colleagues to know how wealthy he has become and others speculate that Gallo doesn't want people knowing how much they forked over to acquire a premium brand. His Cabernet of importance is called "Papillon" and it's a big, gobs o'fruit kind of wine. The wine typically has Cabernet Sauvignon with Merlot, Cab Franc, Malbec and Petit Verdot in unspecified percentages. The hands depicted on the label are those of a Napa Valley old-timer, Vince Tofannelli. He's a grape grower whose family has been farming in the Calistoga area for several generations. When Gallo bought the brand, of course, that means they control its marketing and where the wine is sold. Despite being "allergic" to Gallo and its products, we continued to order Papillon from the distribution company that handles this. Week after week...nothing ever arrived, though the sales rep dutifully wrote down the order. Finally we asked for contact information for the person that gives the "okay" for them to part with some boxes of this. "All Orin Swift wines for various are allocated at this time. I understand you have been a supporter in the past and I appreciate you reaching out. Now that I have your information, if/when cases become available we will surely be in touch with you. " We then said that having brand loyalty was apparently not valued by Gallo. "As we look at the limited amount of cases available unfortunately we have to stick to certain parameters. I can let you know if anything changes. The day we received that missive we headed, after work, to our favorite grocery store to pick up provisions for dinner. As we entered the store we saw bottles of Papillon showcased in a glass cabinet adjacent a display of fresh mangos and pound bags of Jelly Beans. That should tell about the winemaking and marketing priorities for Orin Swift wines. And so now you know why you won't be seeing the Orin Swift wines on display at Weimax in the future. 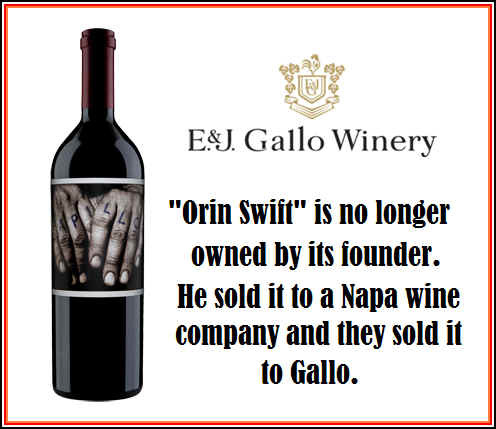 By the way, if you have a look at the web site of Orin Swift, notice that there is not a single mention of the Gallo folks being the owners of this brand. They seem to want to distance themselves as being affiliated with various wineries which they have snapped up in recent years. 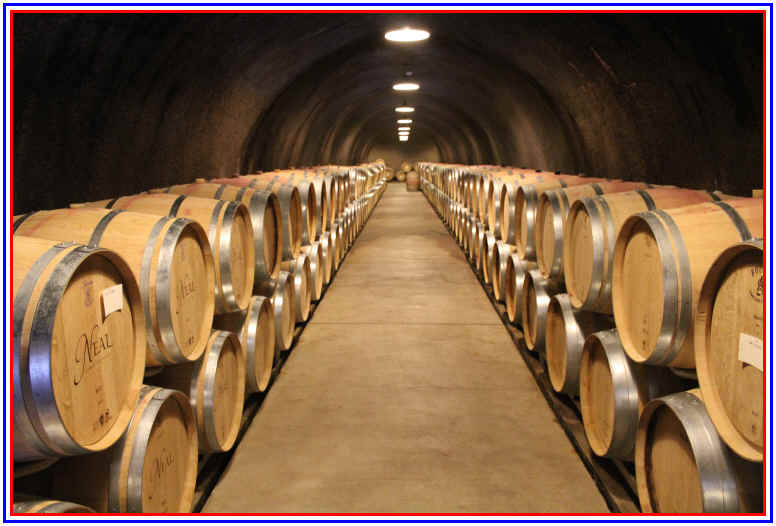 Have a look at the web site of Talbott Vineyards, another winery owned by Gallo. Not a peep about the winery being owned by Gallo. Currently in stock: ORIN SWIFT "Papillon" Long Sold Out. A real estate mogul named Rennick Harris (and his wife Marilyn) owns this exceptional Oakville property. Unlike so many Napa Valley vintners, though, they're not newbies to the wine world. The couple moved to Napa in the 1960s, though Marilyn's grandparents came from Italy back in the 1890s. He worked in real estate and sold a lot of property in Napa, especially in and around Oakville. They bought some property in Napa in 1960's and were dabbling with vineyards, having purchased a prune orchard. The wine business was not as big a deal then as it is today. They were further drawn in to the wine world after taking a wine class taught by Napa Valley legend, Louis Martini. Heidi also consults for a number of other wineries and has her own brand of wine, La Sirena. In fact, she's in such high demand, her preferred mode of transportation isn't a bike or 4 wheel motor vehicle, but a helicopter. Yes...she pilots a chopper! 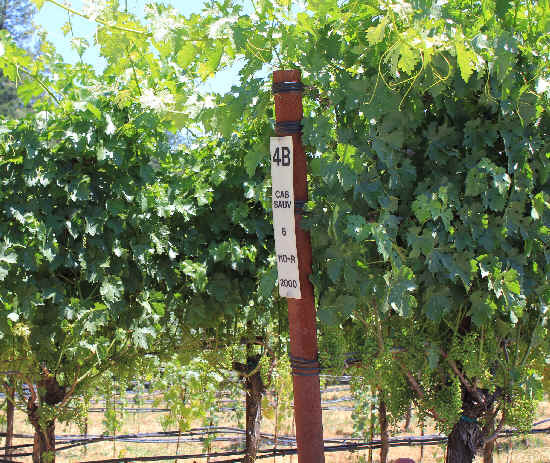 The original plantings at Paradigm were a mix of typical Napa Valley vineyards in those days. There was Pinot Noir, Riesling, Chenin Blanc and Pinot Chardonnay (that's what it was called back then...it was thought to be a white cousin of Pinot Noir). These days it's predominantly Cabernet Sauvignon with a modest amount of Merlot. They also have a bit of Petit Verdot, Cabernet Franc and some Zinfandel. We'll admit to being a bit late for the train here. Early vintages were good, but we've have Paradigm Cabernet in the shop for but a few years. We like Heidi's no-nonsense approach to the wine. No residual sugar. No fake oak. She lets the Oakville Cabernet take the spotlight. There's not a "formula" involved to producer this wine. Just good grapes. The 2014 is the current offering. Eight percent Merlot and one percent each of Cabernet Franc and Petit Verdot. It's a wine that's certainly drinkable presently, but if you taste this now, you'll see it has the acidity and tannin (and fruit) to be cellared for 5-10+ years. Heidi doesn't cater to the market for fat, low acid, flabby wines with sugar to insure numerical scores. If the critics appreciate the wine, fine. If they don't, too bad. If you're opening a bottle of this now, please splash it around in a wide decanter an hour, or so, ahead of dinner. We've found it seems to blossom nicely. Currently in stock: 2014 PARADIGM Oakville CABERNET SAUVIGNON Sale $79.99. The PlumpJack estate was known to us back in the late 1970s/early 1980s are "Villa Mt. Eden" and it was owned by the McWilliams family. The first vintage of Cabernet was made by Nils Venge and it put the property on the map, being one of the most exciting, new wines of its day. 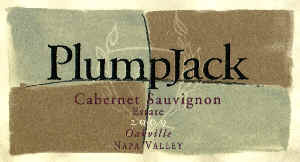 The property was purchased in 1997, or so, and so the PlumpJack wine brand was born. It's owned by a couple of locally famous people: political mover & shaker Gavin Newsom (former San Francisco Mayor and current Lieutenant Governor of California) and money-man Gordon Getty. The 2013 Cabernet comes from grapes grown on the PlumpJack Estate. It's 97% Cabernet Sauvignon and 3% Petit Verdot. They did a cold soak before starting the fermentation. 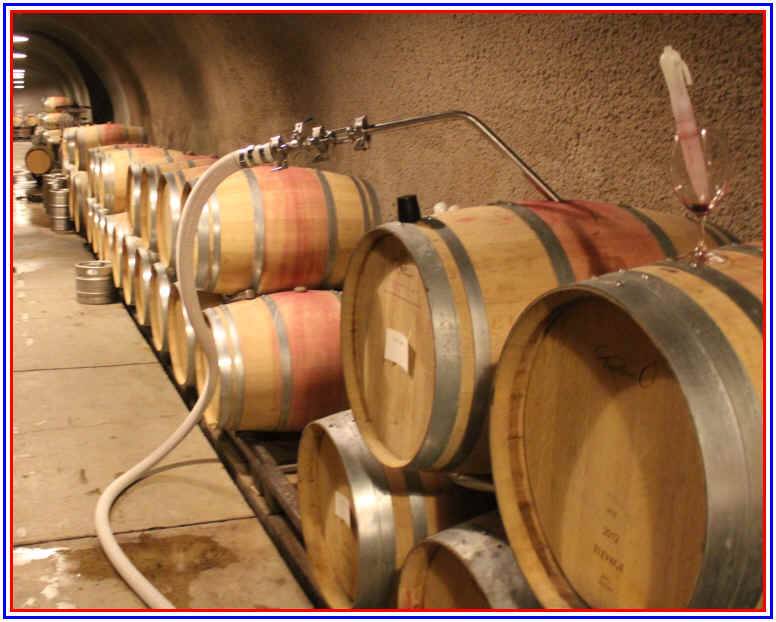 After the fermentation the wine went into 80% new French oak from a quartet of barrel builders. It's fair potent, so fasten your seat belt when drinking this at the dinner table! Georg (that's how his name is spelled Rafael made his fortune in the hotel business, starting out as an elevator operator and eventually working his way to the top. He had been exposed to vines and wines in France's Provence region when he was a young fellow and the dream of owning a vineyard simmered for many years before it became a reality in the Napa Valley. Running a bunch of first class, fancy hotels in different places around the world often meant incorporating a high caliber restaurant and Rafael continued dreaming of wine, as it was a major part of the dining rooms located in his hotels. When the Napa Valley wine business was in its infancy, he purchased some property and planted Chardonnay and Cabernet in what is the Oak Knoll District, bordering the Mount Veeder appellation. Over the years, grapes were sold to Robert Mondavi Winery for its 'reserve' program, Duckhorn and Far Niente. And eventually, Rafael launched his own label in a small way. His son Marc is involved in the family wine adventure and we've found a few vintages over the past decade to be of good quality and value. We currently have the 2010 vintage in the shop. I believe it's entirely Cabernet Sauvignon, but they employ two types of vinification: one is fermented in tank with twice daily pump-overs, while the other lot is fermented in open top fermentation tanks and the grape skins which float to the top thanks to the formation of carbon dioxide and punched down a couple of times a day to help extract more color and character. After the various tanks have finished fermenting, the new, raw wine is transferred into French oak for maturation. The 2010 spent 22 months in wood, with 40% of the barrels being brand new. Despite this healthy percentage of new cooperage, you won't find much oak in the wine. Rafael's Cabernets, though they have the typical 14.5% alcohol which has become the 'norm' these days, are a bit "old fashioned." The wine is not a fruit bomb and the various vintages we've tasted have not been oak bombs, either. The 2010 is beautifully balanced and a bit more modern than earlier vintages. That is, you'll find more black fruit notes here and a touch of sweet oak. It seems to us to be a shade less overtly tannic than earlier vintages.